I made more tags because I just can’t help myself. Which in hindsight was a good thing, I only have one tag left after Christmas. 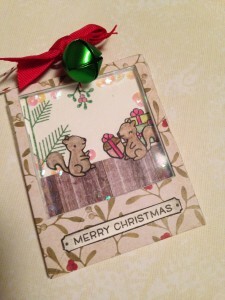 Extra Details: I started by die cutting my tags from some water color paper. 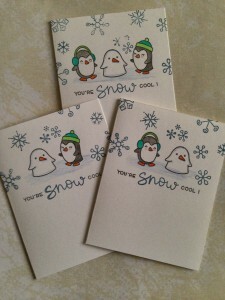 I used a snowflake embossing folder to dry emboss each tag. I added ink to the folder before I ran it through my die cut machine. I like the results for the most part. I die cut the tiny tag shapes form blue, red, and brown card stock. 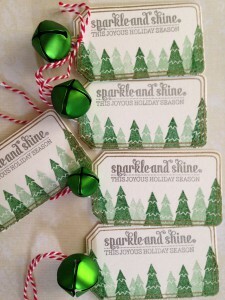 I used white, silver, and gold embossing powders to add sentiments to each of the tiny tags. I used natural twine to attach a tiny tag to a big tag. Extra Details: I started with half a sheet of water color paper. I stamped the images in a copper ink. 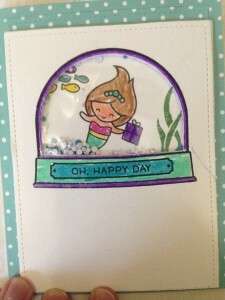 I added some clear embossing powder to help set the ink faster. Using distress ink, I added color to the trees and stars. I wasn’t careful about my water coloring; I wanted the loose and messy look. While, the ink was drying I die cut the Tiny Tag shapes from some green cardstock. Using copper ink, I added a sentiment on each tag. Then, I die cut the big tag shapes from the water color paper. I used a natural twine to attach a small tag to a large tag. I made more tags because I just can’t help myself. Which in hindsight was a good thing, I only have one tag left after Christmas. 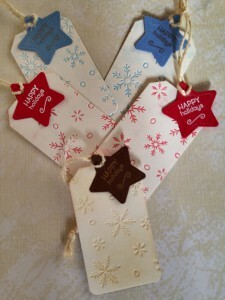 I have a lot of this Lawn Fawn twine in my stash, so I created some tags that I could use it on. Extra Details: I started with half a sheet of water color paper. I stamped and silver embossed snowflakes all over it. Then, using Distress Inks, I smooshed ink all over the paper. I let the first layer dry and then added some more ink smooshing. I also added some flicks of each of the colors as well. 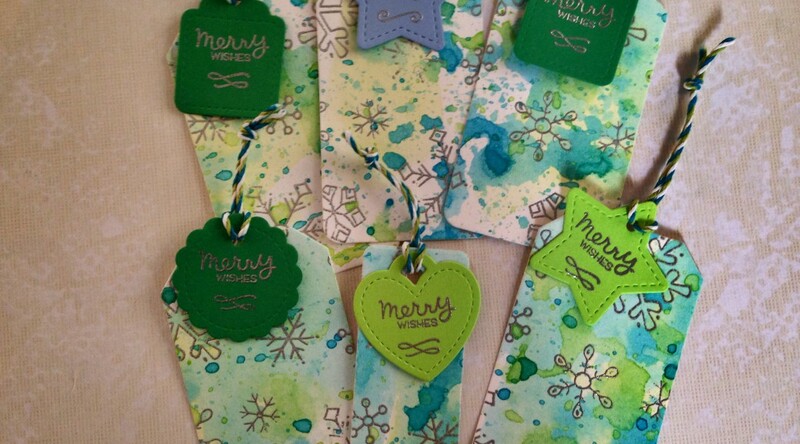 While, the ink was drying I die cut the Tiny Tag shapes from some blue and green cardstock. 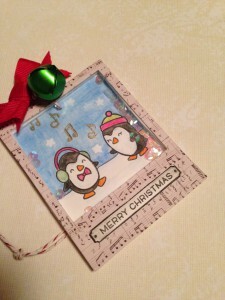 Using silver embossing powder I added a sentiment on each tag. Then, I die cut the big tag shapes from the water color paper. 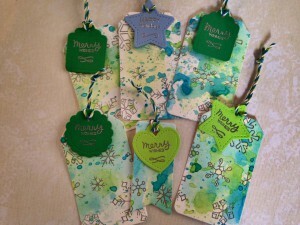 I used blue and green twine to attached a small tag to the large tag. 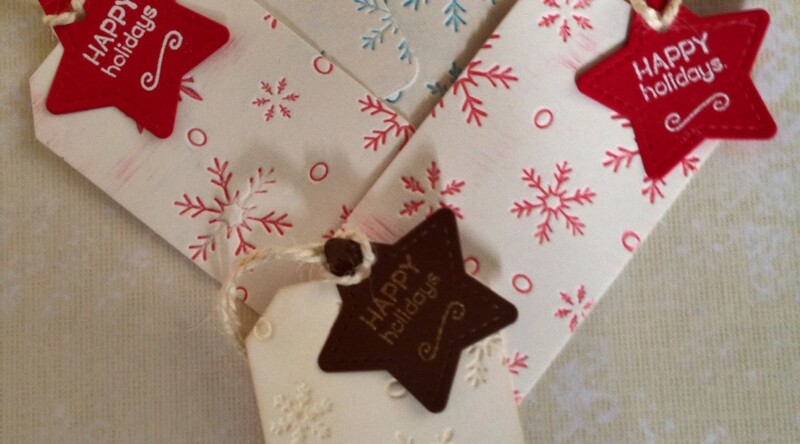 Extra Details: I started by die cutting the tag shape from some white cardstock. I them stamped the tag outline on each die cut. I heat embossed that in gold. I stamped the sentiment next and embossed that in silver. 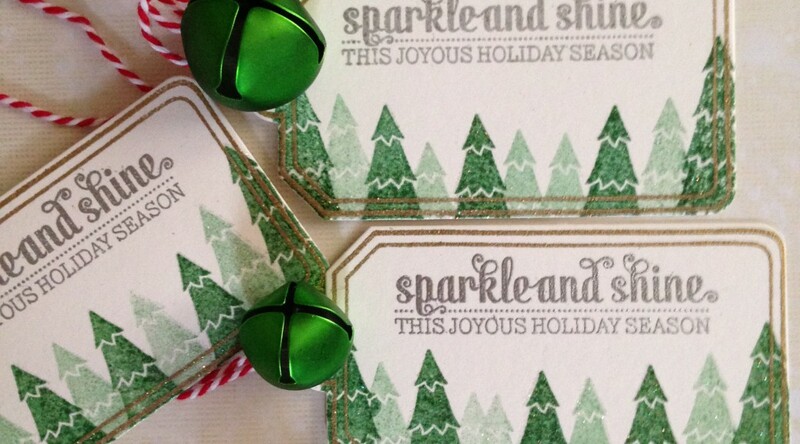 Using a green ink, I stamped the trees on the bottom edge. I used second generation stamping to get some interest. 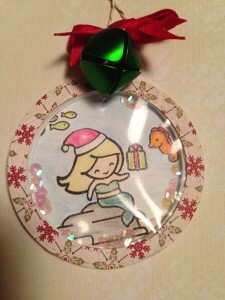 I re-stamp all of the trees with Versa Mark ink and added holographic embossing powder. It’s hard to tell in the picture but the trees really sparkle. 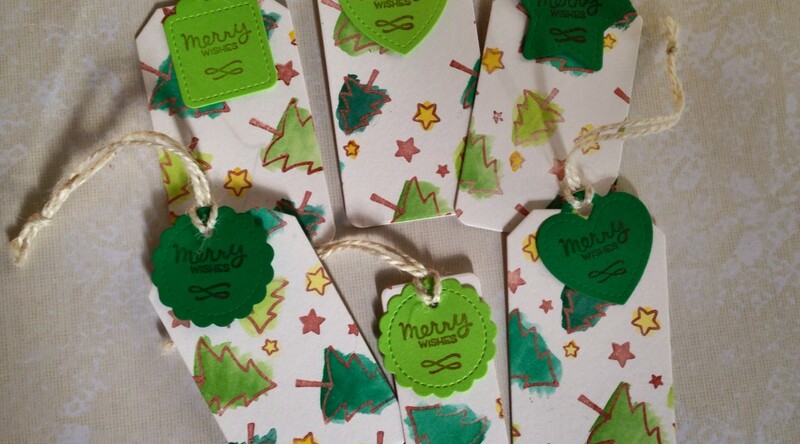 Lastly, I added some red and white twine and a green jingle bell to each tag. This is the card my daughter made for her GG. We have discovered how wonderful watercolor pencils are. She was able to color the sky and igloos and then blended the colors together with water. The effect is a beautiful sky. 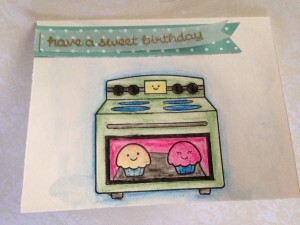 Extra Details: We started by stamping the images and sentiment on the card base. 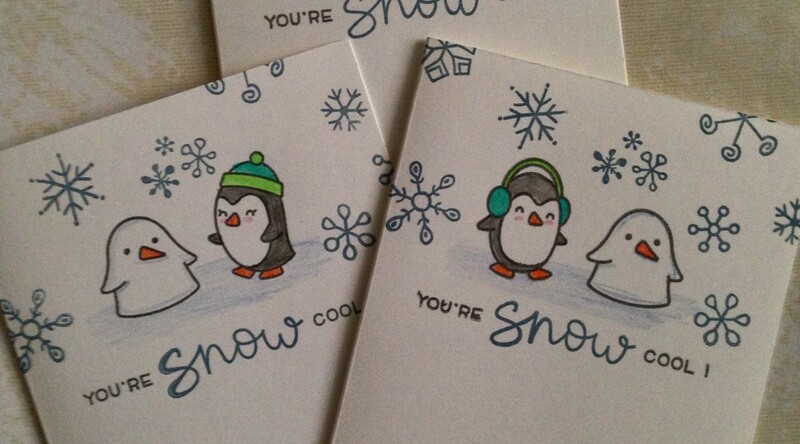 We used a blue ink for the snow images to make them look colder. 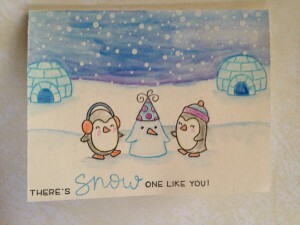 My daughter used watercolor and regular colored pencils to color her card front. 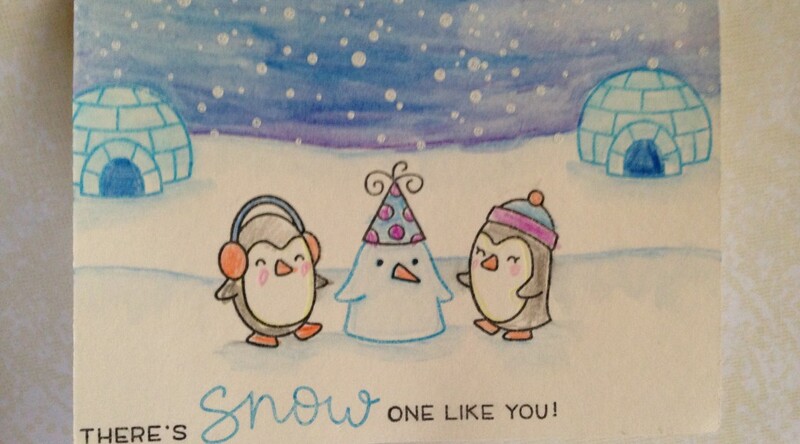 We blended the watercolor pencils out for the soft sky and snow. Lastly, I heat embossing some white snow on the sky. This is the card my son made for his GG. He used water color pencils to color his images. Then, I used a water brush to blend the pencils together. I really like the way this card turned out. 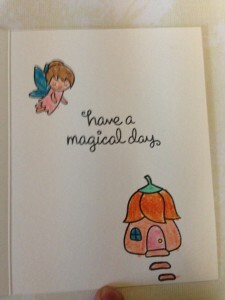 Extra Details: We started by stamping the images on the card base. 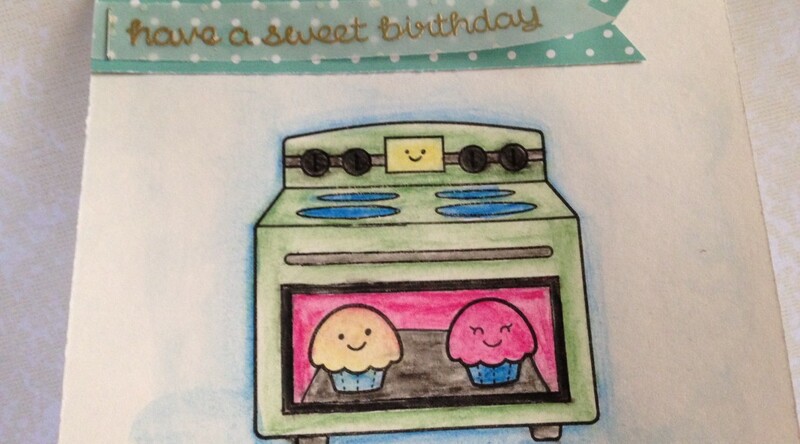 My son colored the oven with water color pencils. I used a water brush to smooth out the colors. I heat embossed the sentiment on a velum banner in gold and layered it with some patterned paper. We stapled the banners to the card front. 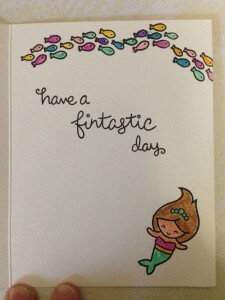 I used a gold gel pen to color the staple to match the embossing. 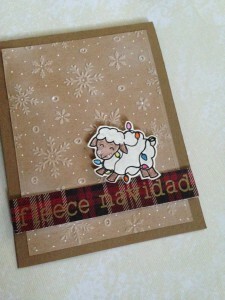 I made a cow themed Christmas card in November and could not resist making a sheep themed one also. Extra Details: I started by stamping and coloring my image. I only masked off the sheep’s face, so that I could make the lights appear behind the head. I used colored pencils to add color. After fussy cutting out the image, I die cut a stitched rectangle form kraft card stock. 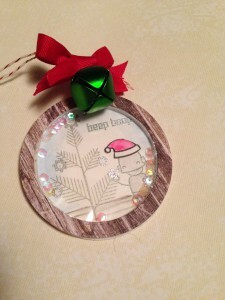 I dry embossing a snowflake design using a Darice embossing folder. 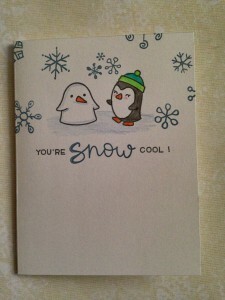 I ink blended some Lawn Fawn Yeti White Pigment ink on the embossed rectangle. I love the way the embossing stands out now. Next, I cut a strip of plaid patterned paper and gold embossed my sentiment. Lastly, I adhered everything to a kraft card base. 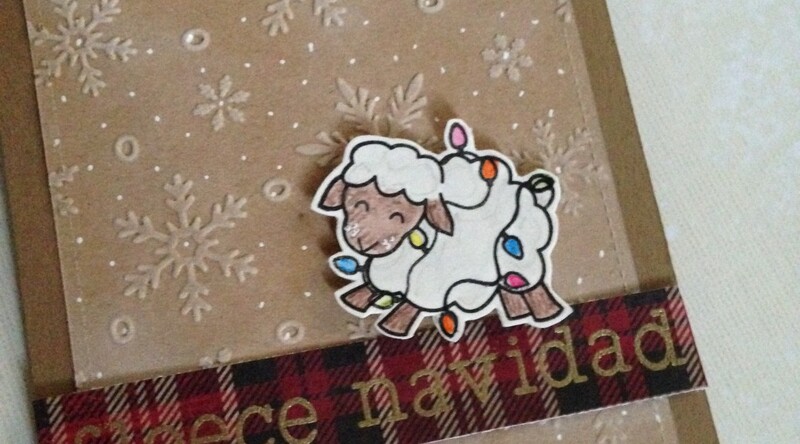 I used dimensional glue dots on the sheep. 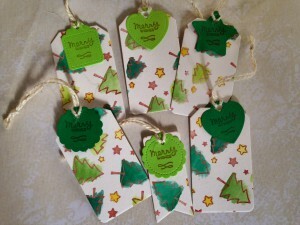 I made special shaker tags for each of my children, my husband, and my grandmother this year. This is the tag for my husband. 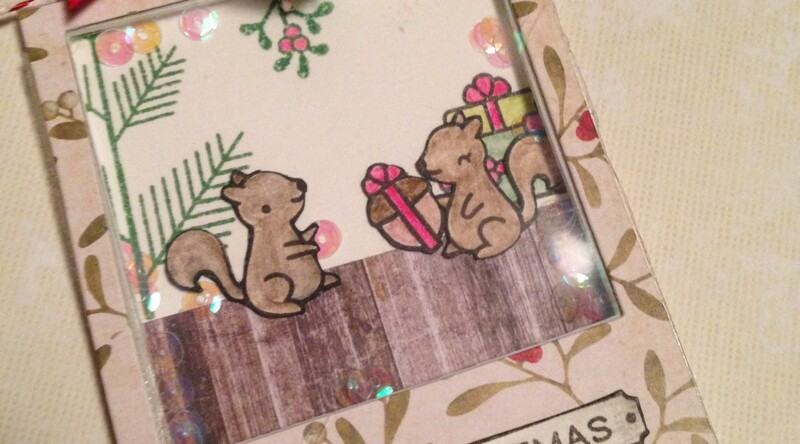 I love the mistletoe paper and the cute little squirrel couple. 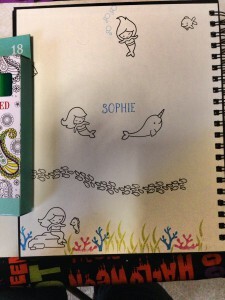 This is the tag for my daughter. She loves the mermaids from Lawn Fawn. This is the tag for my son. I used a lot of silver embossing powder on this tag to make things look metallic. I love the gear ornaments on the tree. This is the tag for my grandmother. She loves music. The penguins are supposed to represent my children. Extra Details: I started each tag by die cutting all of the pieces I would need: a patterned paper frame, a piece of acetate, two fun foam frames, and one backer piece from heavy water color paper. I created my scenes on the water color pieces. 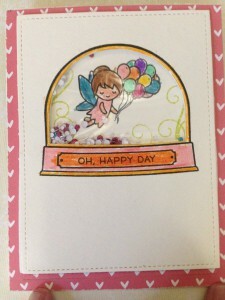 I did some heat embossing and fussy cutting. I used water color pencils to add color to everything. Then, I created my shaker box. I glued the acetate to the back of the patterned paper frame and then glued both layers of fun foam. Once those were dry, I added sequins and glued on the scenes. As a final touch, I added some twine and green jingle bells. I still felt that the tags need something, so I added a red bow to each. My daughter attended a birthday party at the beginning of the month for twin girls. She gave each girl a drawing pad, colored pencils, and a pencil case. 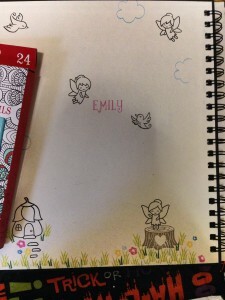 To make the drawing pads unique for each girl, we stamped a color your own scene on the front cover. We also made shaker cards to match the scenes. As a teacher, I need a lot of thank you cards at the end of December. 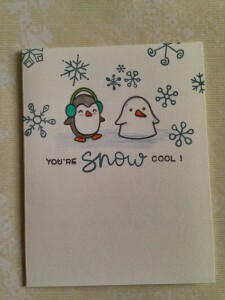 I love the Snow Cool penguins and wanted to use them. I made three different versions. 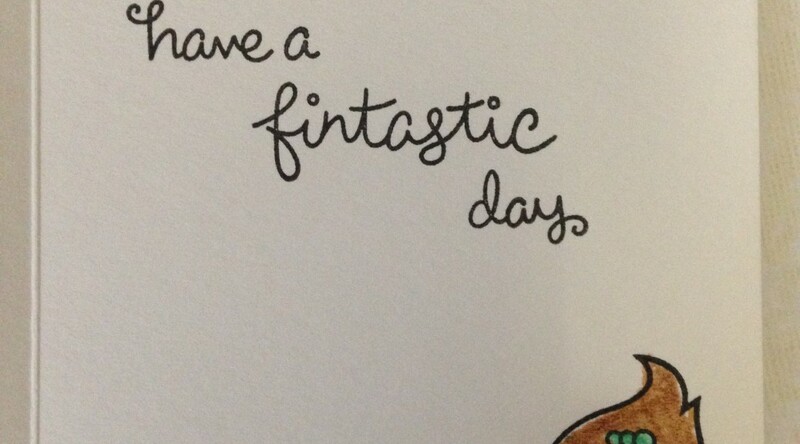 Extra Details: I stamped all the images in a dark grey ink. 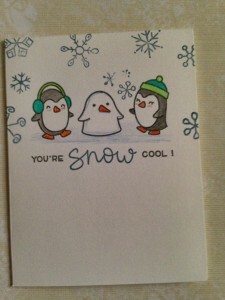 I used a chalk ink for the snowflakes and the word snow. I added the color with colored pencils.